If you're going to use a blender primarily for iced, mixed beverages just for you, or you love a smoothie on-the-go, a single serve blender will quickly become your favorite appliance. While it's not, technically, a single-serve blender, the Cuisinart SmartPower CPB-300 (Est. $55) is a great choice if you need a full-size blender, but you also want to be able to make individual smoothies for everyone in the family and give them the option of taking them to work or school. It includes one 32-ounce blend jar, an 8-ounce chopping cup and a set of four, 16-ounce travel mugs. You can use the large blending jar as a traditional blender, or you can make individual smoothies right in the travel mugs. Commuters, especially single people, love being able to make four smoothies before they have to run the dishwasher, while families appreciate being able to customize their drinks to meet their individual preferences. The larger jar and small chopping bowl means that the Cuisinart CPB-300 is more versatile than just solo smoothie makers, and it gets good reviews for pureeing and general mixing and blending. One expert reviewer says it's a full-service blender that takes up half the space of a normal one. Don't expect it to perform like a high-end blender, however, because that's not the market that it's targeting, it's not your best choice if you need a blender for frequent use; for challenging tasks; or for tasks where some finesse is required, such as whipping creams or making emulsions However, if you only use your blender for occasional food prep, this will give you plenty of interesting options for use. Where the Cuisinart CPB-300 really shines is in ease-of-use. All parts are dishwasher safe, and with several cups included, they don't need to be cleaned as frequently as they do when using a standard blender. The travel cups have lids, but with open holes at the top for drinking. That makes it perfect for a straw, but unsuitable in situations where tipping may be a problem. If you don't need that many accessories for your personal blender, take a look at the NutriBullet Pro 900 Series (Est. $70). It's the top pick at Your Best Digs which tested it for 18 months initially, and then for 40 additional hours -- an indication that durability is good. In testing, the NutriBullet blended the smoothie ingredients very quickly, taking only 12 seconds, and the resultant mix was smooth. The NutriBullet also felt sturdier and more durable than the other smoothie-makers tested. Owners like it too, saying it's very powerful, especially for such a compact blender. This package includes a 32 ounce blending cup and a 24 ounce cup, as well as a handled lip ring for the 24-ounce cup and a flip top lip ring that will fit either of them. It may sound like a strange adjective to use for an appliance, but the word "fun" is often included in reviews of the Hamilton Beach Single Serve Blender (Est. $20). People quite simply love it. One expert reviewer even marvels at how it dominates in performance over single serve blenders costing three or four times as much. The Hamilton Beach Single Serve Blender is easy to use, but owners say you'll get the best results if you read the manual and take a little extra care, rather than just tossing ingredients in willy-nilly and leaning on the blend button. Most have no problems blending normal smoothie ingredients -- ice cubes, frozen strawberries, banana chunks, apple pieces with skin, spinach, even sticky prunes -- as long as they include plenty of liquid. They also say they get better results on pulse than on the regular blend setting. Hamilton Beach recommends hand washing the cup and lid, and wiping down the base with a damp cloth; however, quite a few owners put the cup and lid in the top rack of the dishwasher and say it doesn't seem to hurt it. 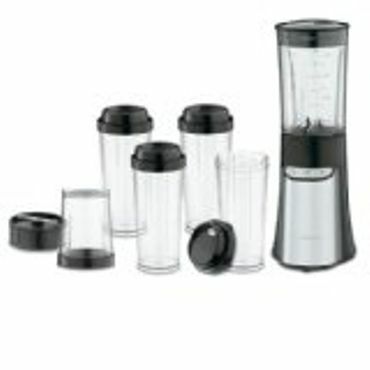 The blending containers on the Hamilton Beach Single Serve Blender are styled to fit in most cup holders, even smaller ones, and they are reported as leak-proof. The one consistent issue we see with the Hamilton Beach personal blender is durability; it may last only a few months. However, most owners say that, for the price, it's worth buying another a few times a year. This blender comes in several different colors, and the price may vary a bit depending upon which one you prefer.